Got a student discipline problem? How would you like to be able to consult with dozens for your colleagues without getting up from your desk? This checklist lets you do just that! Sixty elementary teachers--each recognized for highly successful efforts at maintaining discipline--share their secrets of classroom management and suggestions for motivating today's students. Practical and easy to read, this checklist will help you be better prepared for beginning the school year; coach you on modeling positive interactions; and remind you of the importance of maintaining flexibility in your discipline strategies. The NEA Professional Library is the book publishing arm of the National Education Association. 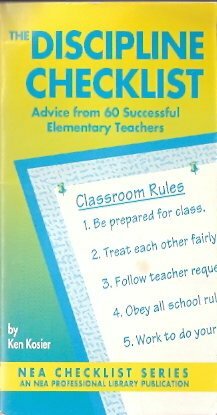 Our books are enjoyed by teachers, education students, education support professionals, higher education faculty and retired educators. Our mission is to provide timely and topical titles that enhance the professional lives of our members.